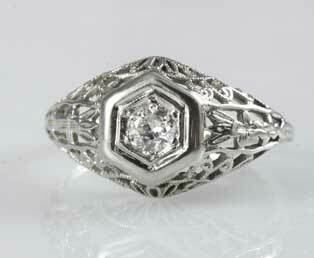 White and lacy describes this ladies 1930s 18kt white gold filigree engagement ring. This estate wedding ring features an old-European diamond held by six prongs. This old diamond is framed by a geometric, hexagonal design. Beautiful feminine openwork filigree accentuates the beauty of this art deco period ring.